INDIANAPOLIS--(BUSINESS WIRE)--Carvana (NYSE: CVNA), a leading e-commerce platform for buying, financing and selling used cars, today unveiled its newest Car Vending Machine in Indianapolis. The online auto retailer’s signature all-glass tower stands seven stories high and displays 26 vehicles. Indianapolis is now home to the first Car Vending Machine in the state and joins cities with counterparts in Texas, Tennessee, Florida, North Carolina, Maryland, Arizona, Ohio and Pennsylvania. Customers who visit Carvana.com can shop more than 10,000 vehicles, finance, purchase and sell their current vehicle to Carvana in as little as 10 minutes. Then, quickly and easily schedule as-soon-as-next-day Car Vending Machine pickup or home delivery. Customers who choose the Car Vending Machine experience will be greeted by a Carvana Customer Advocate upon arrival, receive a commemorative, oversized coin, which they then insert into the coin receptacle to vend their car, as easy as a bag of chips. This fun, unique pickup experience typically takes only minutes, compared to hours haggling at the dealership. Plus, every Carvana vehicle comes with a seven-day return policy, giving customers the peace of mind and time to ensure the vehicle fits their life. Whether it’s making room for strollers or sports equipment, customers get an upgrade from the traditional dealership test drive of four right-hand turns around the block. Every Carvana vehicle is Carvana Certified, having passed a rigorous 150-point inspection, has never been in a reported accident and has no frame damage. Features, imperfections and updated information about open safety recalls are listed on every car’s vehicle description page. Located at 8130 Summit Hill Drive, the Indianapolis Car Vending Machine is open Monday through Saturday from 9 a.m. to 7 p.m. ET. Vehicle pickup at any of Carvana’s Car Vending Machines is free for all Carvana customers. For those who live outside of the Indianapolis metro area but would still like to pick up their car at the Vending Machine, Carvana will subsidize $200 in airfare and arrange transportation from the Indianapolis International Airport. Founded in 2012 and based in Phoenix, Carvana’s (NYSE: CVNA) mission is to change the way people buy cars. By removing the traditional dealership infrastructure and replacing it with technology and exceptional customer service, Carvana offers consumers an intuitive and convenient online car buying and financing platform. 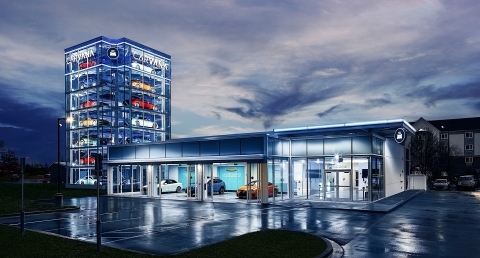 Carvana.com enables consumers to quickly and easily shop more than 10,000 vehicles, finance, trade-in or sell their current vehicle to Carvana, sign contracts, and schedule as-soon-as-next-day delivery or pickup at one of Carvana’s patented, automated Car Vending Machines. Carvana has launched its 15th Car Vending Machine, located in Indianapolis, the first of its kind in Indiana.